Glasgow is understood to be in the frame to host Great Britain’s Davis Cup World Group play-off tie against Uzbekistan in September. Leon Smith’s side – who must win to continue their five-year stay at the elite level of the competition after losing their first-round clash with Spain in February – were handed a kind draw yesterday. Denis Istomin, the world No 83, is the only Uzbek player ranked in the top 300. 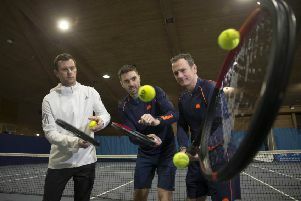 The tie will take place on 14-16 September and, although the Lawn Tennis Association is still to announce details, Glasgow is expected to be high on its list of possible venues. The Emirates Arena, constructed for the 2014 Commonwealth Games, has hosted ties against Argentina, Australia and the US in recent years, while the SSE Hydro was the venue for November’s charity match between Andy Murray and Roger Federer. Murray, currently out of action because of a hip injury, is hoping to be back in action by the summer and could play a part against Uzbekistan. Even without Murray, though, Britain should have enough quality to negotiate the tie – fellow Scot Cameron Norrie performed heroics in the absence of both the former world No 1 and Kyle Edmund during that defeat by Spain earlier this year.